Her Gift arrives at age 15! For cookery or fixing any hair, like her aunts? Oh no! Not talking to ghosts?! Maybe Evie will be the one Messenger in her family line who doesn’t have a psychic gift…nope! The Florida teen can see and hear and communicate with dead people! How can that girl Tommie get into their house without Evie’s momma and stepdad hearing her? Should Evie really kiss cute Buddy from across the street? Wild thunderstorms, seeing dead people, and going to a new high school – what a birthday week! Yes or no for seeing dead people yourself? Book info: Messenger / Carol Lynch Williams. Paula Wiseman Books (Simon Schuster), 2016 (hardcover), 2017 (paperback). [author site] [publisher site] Review copy and cover image courtesy of the publisher. Her virgin birth – science proves true. Toys speaking messages from Beyond – also true. People snatched by a sky-portal when she heals others – ditto. Elena didn’t ask for healing powers, or for a drunken stepfather, or for inanimate objects to channel divine instructions to her since childhood. But in author Hutchinson’s odd Florida (setting of his At the Edge of the Universe , my pick here) strange things happen regularly. What is stealing away people? Why? Where do they go? Maybe it’s a better place than Elena’s high school and now-constant demands that she heal people. Book info: The Apocalypse of Elena Mendoza / Shaun David Hutchinson. Simon Pulse, 2018. [author site] [publisher site] Review copy and cover image courtesy of the publisher. Grab some junk food and a towel, a couple of maps,some sights to see, and make some memories on the road. Yes, there really is a Niceville, Florida and a huge Old Joe stuffed gator at Wakulla Springs and a mysterious Coral Castle. The three teens take turns telling their story as a straightforward trip down to the University of Miami turns into quite the adventure. The three authors who collaborated on How to Be Bad took their own road trip so they could weave Florida’s true atmosphere into every page. 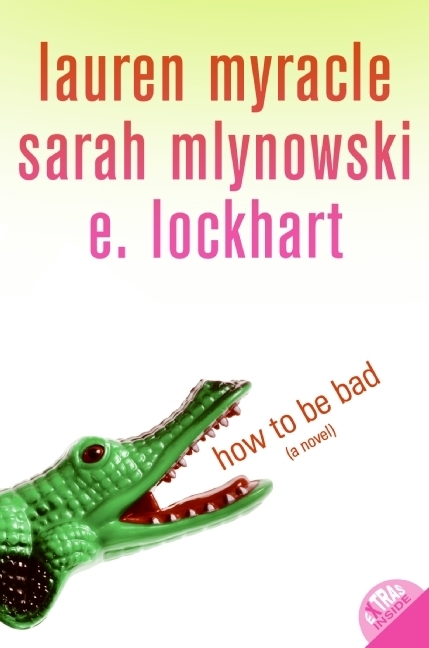 Book info: How to Be Bad / Lauren Myracle, Sarah Mlynowski, E. Lockhart. Harper Teen, 2008. [Lauren’s website and Facebook] [Sarah’s website] [Emily’s website and blog] [publisher site] [book trailer] Review copy and cover image courtesy of the publisher. My Book Talk: Summer before senior year should be more than just work, everyone says. So Jesse decides on a quick road trip with her best friend Vicks, and yeah, the new girl can go, too. Long miles and long days later, the three have more adventures than they planned on and make some memories they didn’t expect. It’s just a road trip for three girls who work at Waffle House together – Jesse isn’t really trying to outrun the news from Mom’s cancer doctor. And Vicks needs to visit her boyfriend at college football camp (not calling her for two weeks – huh!). Even misplaced rich girl Mel wants to see huge Old Joe gator and Coral Castle and other unique sights featured in Fantastical Florida. Nine hours to Miami, nine hours back, an easy weekend drive, right? Jesse does need some time away from Mom and all the dogs at their trailer for grooming and Mom’s boyfriend with the icee cart. They just can’t see how praying about Mom’s diagnosis would help, how going to church with Grandma would make them all feel better. The little sister to a houseful of big brothers, Vicks loves sports and weird stuff like Old Joe, refuses to be a clingy girlfriend – still not cool that Brady won’t call her from the university after they’ve been dating for a year. She’ll just remind him how she’s different from all those athlete-worshippers he’ll meet in Miami. Mel’s rich dad keeps moving their family around, so here they are in Niceville, another big house, another place to not fit in. A middle kid, she gets outvoted by her crazy younger brother and perfect older sister on everything. Having a chance to make some real friends – that would make paying for any road trip worthwhile. A temperamental car, roadmaps gone wrong, detours and cute guys and crazy weather – each chapter is written from one girl’s viewpoint by one author, creating a triple look at a simple road trip that turned into so much more. Who knew that trying to be a little bad could turn out to be good after all?